Gary Mackay-Steven had been on a night out in Glasgow. 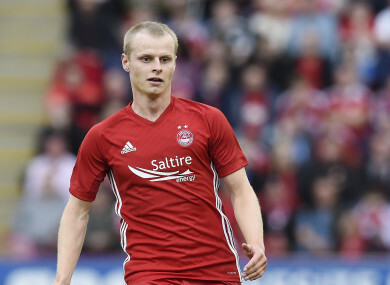 SCOTTISH PREMIERSHIP FOOTBALLER Gary Mackay-Steven had to be treated for hypothermia after being pulled from a river by emergency services, his club Aberdeen confirmed today. “The club can confirm Gary Mackay-Steven was involved in an incident in the River Kelvin on Sunday morning,” Aberdeen said in a statement. Scottish media reports said Mackay-Steven, 26, had been rescued from Glasgow’s River Kelvin after a night out with a fellow player. He had sat on the bench for Aberdeen’s 4-3 win over Glasgow club Partick Thistle on Saturday. “At 2:46am (0146 GMT) on Sunday, August 27 the Scottish Fire and Rescue Service was alerted to reports of a man in the water at the River Kelvin near Benalder Bridge in Glasgow,” said a Scottish Fire and Rescue Service spokesman. “Four appliances attended and specialist water rescue crews safely assisted the individual out of the water — he was then transferred into the care of paramedics after suffering the effects of hypothermia. Police Scotland said the man was taken to Glasgow’s Queen Elizabeth University Hospital for treatment. Capped once by Scotland, Mackay-Steven joined Aberdeen from Scottish champions Celtic in July. Email “Scottish international 'recovering at home' after being rescued from a river ”. Feedback on “Scottish international 'recovering at home' after being rescued from a river ”.